Until 2013, Liberia had never seen Ebola. Most of Liberians knew nothing about the virus. In fact, information was initially so sketchy that many people didn’t believe it was real. This was compounded by distrust in government officials, following 14 years of civil war. Extreme poverty, an under-resourced and stretched health system, outbreaks in densely populated urban areas, and local burial customs of washing the dead by hand all contributed to Ebola quickly reaching epidemic proportions in the country. As the rest of the world slowly woke up that this was a humanitarian crisis of epic proportion, fear and panic took root in Liberia. 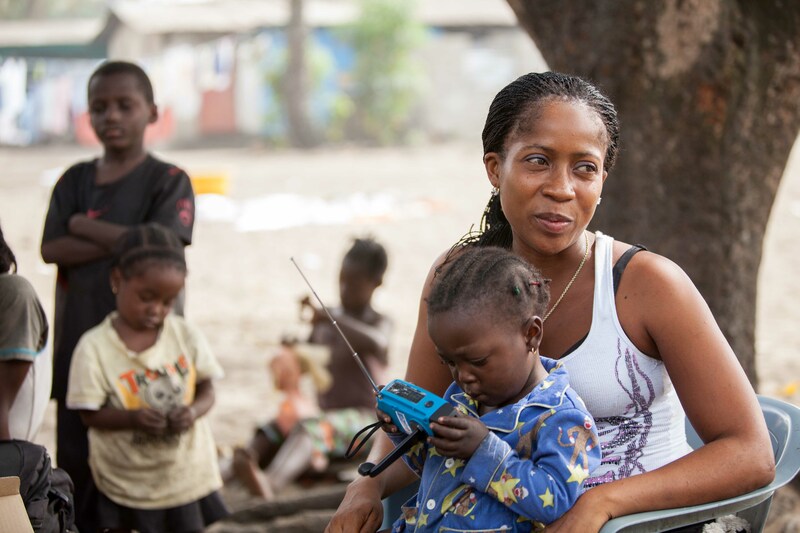 Into this, local radio stations played a leading role in helping to educate and inform communities about Ebola. They broadcast overall health information, advice on how to identify early symptoms and prevent transmission, and what to do and where to go for assistance. Most importantly, the information that was so desperately needed was coming from voices that people felt they could trust. We partnered with the United Nations Development Programme (UNDP) to send our emergency solar Polaris radio/lights to badly affected areas in the country. The UNDP worked closely with Liberia’s Ministry of Health and Social Welfare, conducting a door-to-door awareness campaign, while searching for the sick and the dead. The radios became a vital component of the campaign, as they provided families who were quarantined with information and education, without needing to rely on batteries or electricity for power. Its LED flashlight gave the added benefit of providing light at night. At the peak of transmission in August/September 2014, Liberia was reporting between 300 and 400 new cases each week. An integrated strategy that included isolation, treatment and effective communication were key to getting the outbreak under control; and on 2 May 2015, Liberia was declared Ebola-free, after 42 days of no new cases. In total, 10,675 Liberians were infected with Ebola during this outbreak, while 4,808 died. More than 70% of the deaths have been women. The story that moved us most was that of Josephine, a 32-year-old Ebola survivor who lost 29 family members, including her husband and her three children. It is hard to comprehend the enormity and devastation of her loss. What is so remarkable about Josephine, though, is that she has since taken in and is looking after six children who had also lost their families to the virus. Josephine was interviewed by the UNDP after receiving her Polaris – and you can listen to her words here. Listen to the official UNICEF Ebola information song for Liberia.